On the 2nd June 1916 the Germans assaulted the sector of the Canadian Corps which lay between Hill 60 and Hooge, where No Man's Land averaged less than 150 yards and captured the last portion of the crest of Ypres ridge which had remained in British hands. A knoll with farm buildings and enclosures was called Mont Sorrell, and then were two 60 metre summits “Hill 60” and “Hill 62” also known as Tor Top. The position gained by the Germans was not only highly important from the point of view of observation but was only 2 miles from Ypres and the Canadians were anxious to recover it. Preparations were made and the attack was originally planned for the 6th June but was postponed because of the weather until 0130 on the 13th June, the 4th Canadian Battalion being one of 4 battalions for the centre and left attack against Tor Top. Private Wilson went absent to avoid participation in this action. The Court Martial was on the 21st June and following confirmation he was shot at Poperinghe on the 9th July. 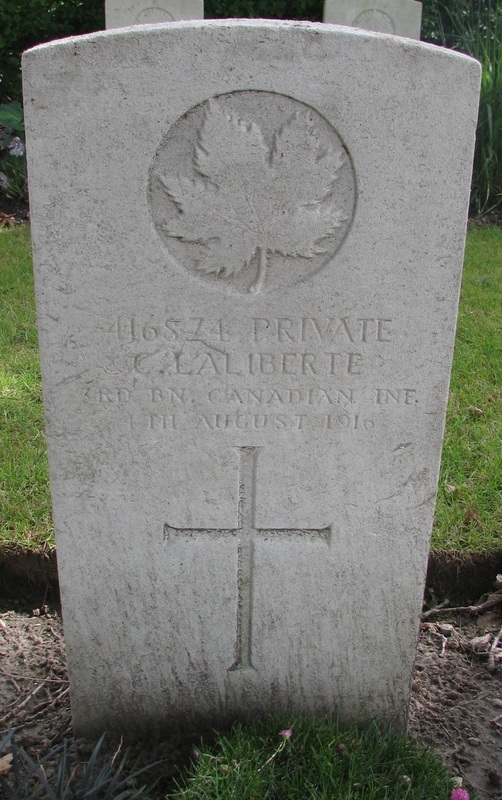 Private Come La Liberte 3rd Canadian Infantry Battalion executed for desertion at 0452 on the 4th August 1916 aged 25 years. The Court Martial was on the 25th July 1916 and following confirmation he was shot on the 4th August. Private Bennett had joined the 3rd Battalion Hampshire Regiment in June 1914 but was not sent to France until November 1915. The Battalion was engaged on the 1st July 1916 advancing at 0740 during the attack on the Redan Ridge. They were swept by machine-gun fire from Redan Redoubt the C.O. and 10 other officers being killed , 310 men killed or missing, 15 officers and 250 men wounded. 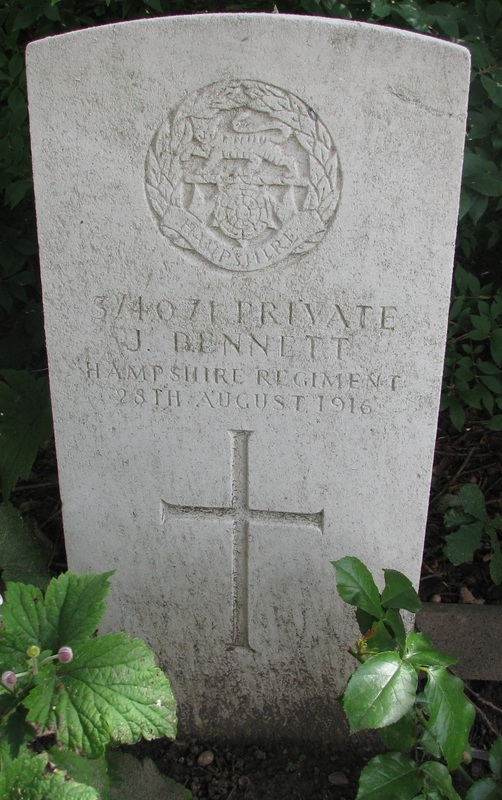 On the 20th July Private Bennett had faced a Court Martial for desertion, probably during the course of the 1st July attack, but was found guilty of absence without leave and sentenced to 2 years imprisonment with hard labour. On the 25th July 1916 the Battalion arrived at Poperinghe in the Ypres Salient. The Battalion had been out of the line at Elverdinghe but returned to the trenches on the 4th August 1916. At about 2200 on the 8th August 1916, the Germans released a concentrated discharge of phosgene gas lasting 10 minutes on the Battalion’s front with the trenches also being heavily shelled. SOS rockets being damp failed to go off and some minutes elapsed before the British barrage came down to join with the rifle fire in driving back any Germans who attempted to reach the British trenches albeit some came within bombing range. The Battalion had nearly 70 casualties, 14 killed or died of gas or missing, a similar number wounded and nearly 40 gassed. During the course of this attack Private Bennett was seen putting on his smoke helmet but when his platoon was ordered forward he was missing. 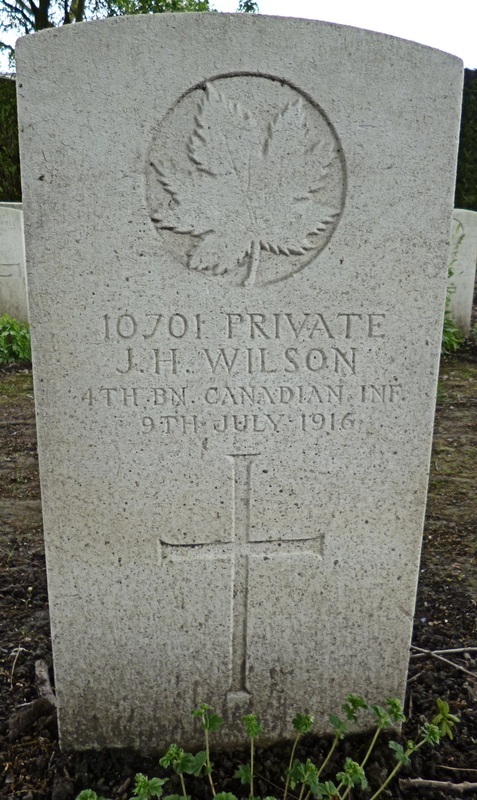 In the early hours of 9th August he was seen nearly a mile in the rear telling another soldier from the Battalion that he had lost his nerve and had climbed out of the trench and when he returned the company had gone. The Court Martial was on the 16th August and subsequently the Brigade Commander recommended that the death sentence be commuted but the Divisional Commander and the Corps Commander Lieutenant General Sir A G Hunter thought otherwise and the sentence of death was confirmed. 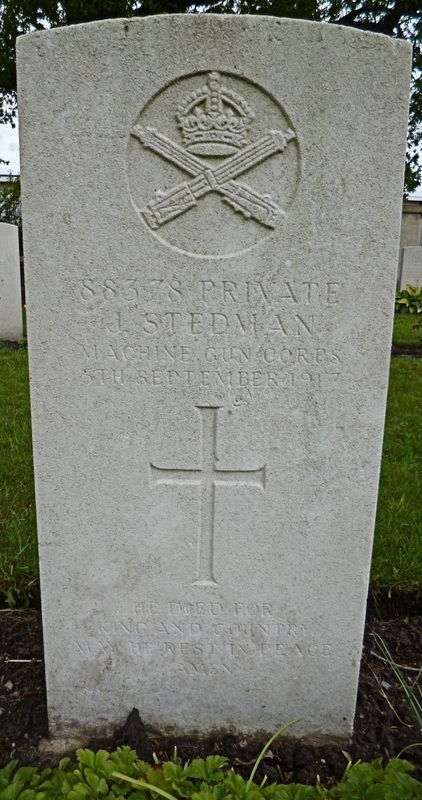 He was shot on the 28th August 1916 aged 19 years. Private Botfield had enlisted in September 1914, went to France early in 1916 and on the 24th January 1916 was sentenced to 90 days field punishment for absenting himself from the reinforcement draft. The Battalion was the Pioneer Battalion of the 23rd Division and arrived in the Baizieux area of the Somme sector (about 5 miles West of Albert) on the 1st July 1916. In June Private Botfield had had two episodes of absence and received 28 days Field Punishment. The Battalion took part in operations at Contalmaison, Pozieres Ridge and Munster Alley on the 8th August 1916 and then the Division moved North to the Ypres Salient. In August he again went absent and was tried by Court Martial and convicted of being absent without leave. By the 12th September 1916 the Division was back on the Somme with the Battalion moving later in the month to Becourt Wood billeted at Bresle (about 4 miles West of Albert). On the evening of the 21st September 1916 Private Botfield’s platoon, with 2 other platoons moved off, their work being the digging of a new cable carrying trench East of Pozieres in the area west of La Sars ready for the major offensive which in fact took place on the 25th September to attempt the capture of the strongholds of Guedecourt, Lesboeufs and Morval. Approaching the site of the new trench the men were in the open, possibly seen by the German front-line troops, and a shell came down near to Private Botfield who ran away. The remainder of the digging party carried on working until 0330 on the 22nd September digging some 250 yards of the new trench and then returned to Becourt Wood and about 0730 he was seen returning to his bivouac and the disciplinary process began. 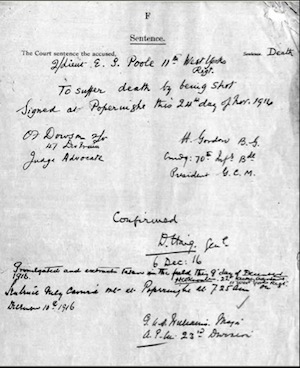 The Court Martial was on the 1st October and the sentence of death was confirmed on the 14th October. 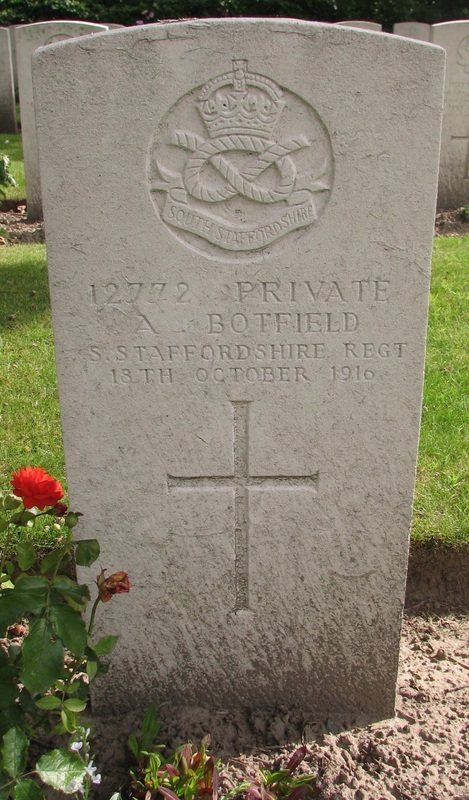 On the 17th October 1916 the Division moved North to the Ypres salient and Private Botfield was shot at Poperinghe the next day, the 18th October. The Battalion had gone to France in May 1915 as part of 154th Brigade 51st (Highland) Division as reinforcements but on the 7th January 1916 the Battalion was transferred to 164th Brigade part of the 55th (West Lancashire) Division and was moved to the sector South of Arras to relieve a French division. On the 25th July 1916 the Battalion arrived in the Somme sector. On the night of 22nd/23rd July an attempt to capture the German held village of Guillemont had failed even though some troops had got into the village but were forced to withdraw. A further attempt on the 30th July also failed and the British losses were so heavy that all the forward troops were withdrawn and in the right sector were relieved when on the 30th July the 55th Division moved up to take over a sector opposite Guillemont. Its capture was of supreme importance to the success of the general advance and a further attack was planned timed to commence at 0420 on the 8th August 1916. The British front line ran about 1500 yards West of Ginchy, 750 yards West of Guillemont and 500 yards to the East of Trones Wood. The 164th Brigade was on the left, to take the northern and southern portions of the village itself, the 165th Brigade on the right to take Lonely Trench and the area south of the village itself. At 1430 on the 7th September 1916 the Battalion was warned that it would move forward to the front line trenches later that day for the forthcoming offensive and the men were instructed not to leave camp (in the Fricourt area). At 1930 the Battalion paraded for the march to the font line but Private Stevenson was missing. On the 7th and 8th a heavy artillery bombardment of the enemy positions and particularly Guillemont village had taken place and the Battalion following a jumping barrage (which gave them little protection) had advanced but found a belt of the German wire about 200 yards from the start line (probably put out during the night) and tried to cut through but suffered heavily from rifle and machine-gun fire from both their front and their right flank and were compelled to return to the British trenches. The attack on the 8th was followed by what was in fact a fiasco on the following day and once again Guillemont remained firmly in German hands. On the 11th August Private Stevenson was arrested in the village of Bussy-les-Daours some 10 miles West of Albert and not far from Fourth Armies Headquarters at Querrieu. His explanation was that he had left his company to look for his brother and on his return the Battalion had gone and had lost his head and drifted away. 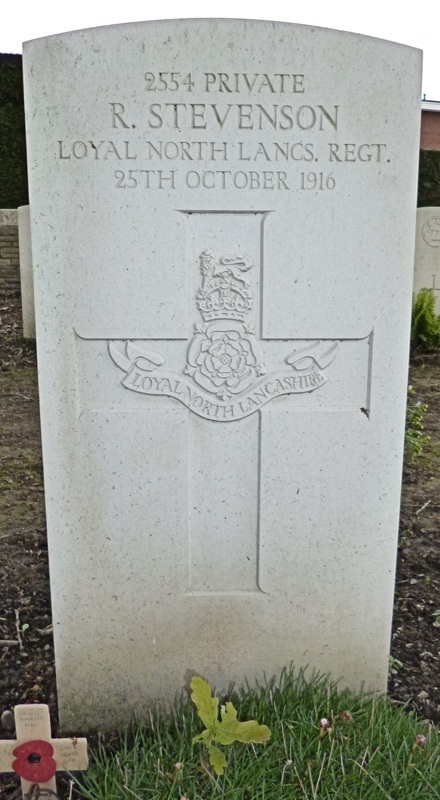 On the 28th/29th September 1916 the 55th Division left the Somme sector for the Ypres salient and the Court Martial was on the 11th October 1916 and following confirmation of the death sentence he was shot on the 25th October 1916 being 23 years of age. The Battalion landed at Boulogne on the 3rd May 1915 with Private McGeehan amongst its numbers as part of the 154th Brigade, 51st (Highland) Division as reinforcements until on the 7th January 1916 the Battalion was transferred to 164th Brigade part of the 55th (West Lancashire) Division and was moved to the sector South of Arras to relieve a French division. On the 25th July 1916 the Division arrived in the Somme sector moving forward on the 30th July to a sector in front of the German held fortified village of Guillemont. Two attempts to take the village had already failed but its capture was of supreme importance to the general advance and a further attack was to take place beginning at 0420 on the 8th August. The 164th Brigade was on the left was to take the northern and southern portions of the village itself with the 165th Brigade on the right to attack Lonely Trench and the area to the south of the village itself. The Battalion was on the left and was to establish contact with elements of the 2nd Division on the line of the railway and the station on the northern outskirts of the village itself. Because the 1/4th Loyal North Lancashire Regiment had been held up by a belt of the enemy’s wire about 200 yards from their jumping off position and were unsuccessful in an attempt to cut through and suffering heavily from rifle and machine-gun fire from their front and their right flank, had been compelled to return to their trenches, the Liverpool Irish (reported to have reached Guillemont station) were in a precarious position. Their right flank was in the air and they were being subjected to heavy machine-gun fire from Guillemont. The Battalion attempted to bomb down from the North and did manage to reach and hold the northern end of the village but it still had not been appreciated that the main defences of Guillemont were not the trench lines in front of the village, which were either lightly manned or evacuated completely before an attack, but the flanking fire from the German defenders in hell holes and occupants of the cellars in the village itself and so such of the Battalion as managed to get into the village were then cut down by fire from the flanks and the rear or were captured by the enemy. The next day at precisely the same time the 165th and 166th Brigades attempted again to capture the village but wire had not been cut, orders were not received until 0300 and gallant efforts were in vain. Guillemont fell to the 20th Division on the 3rd September 1916 and Ginchy to the 16th (Irish) Division on the 9th September. The next major engagement of the 55th Division was the Battle of Morval and the 1/8th Kings Liverpool were engaged on the 27th September to exploit the successes of the opening phase on the 25th and 26th; the objective was the capture of Gird Trench and Gird Support north west of Guedecourt an following a heavy bombardment, when the barrage lifted at 1423 the Battalion was close up to it and by 1430 had captured Gird Trench and at 1515 had captured and were consolidating Gird Support with the Germans in full retreat across open country being caught in the British artillery bombardment suffering heavily. A German counter-attack at 1550 was caught in the British barrage again and suffered further heavy casualties without being able to even reach the trenches the Battalion was holding. The attack was crowned with signal success but before the attack began Private McGeehan, who had survived the unsuccessful attack with heavy casualties on the 8th August, deserted. 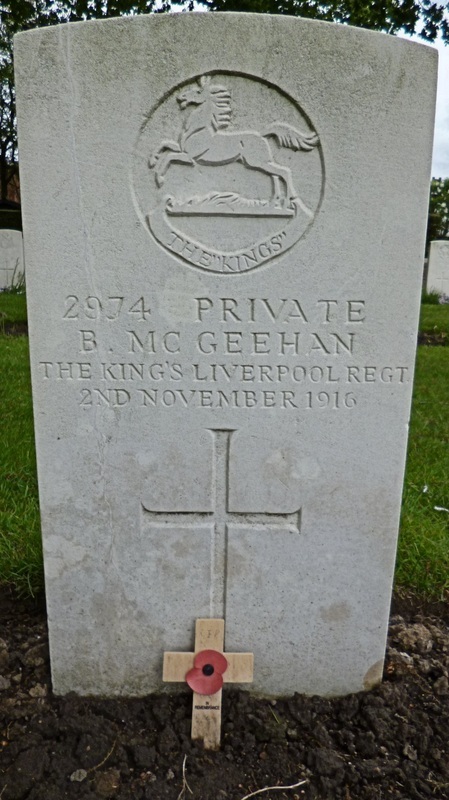 On the 28th/29th September the 55th Division left the Somme sector for the Ypres Salient; The Court Martial was on the 21st October 1916 and following confirmation of the sentence Private McGeehan was shot at Poperinghe on the 2nd November 1916. 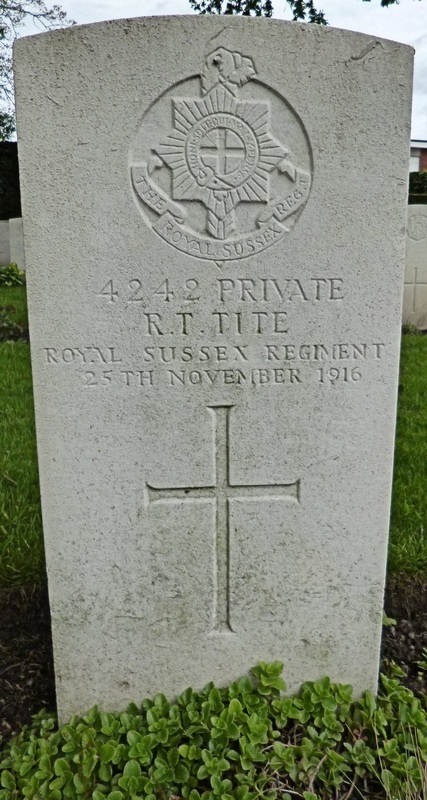 Private Tite volunteered for service in the Army in October 1915 and probably went to France in the Summer of 1916. The Battalion, part of 116th Brigade, 39th Division arrived on the Somme on the 27th August 1916 but already on the 1st August 1916 Private Tite had disobeyed a lawful command subsequently being convicted by Court Martial and being sentenced to 4 years penal servitude which was as usual then suspended. The Battalion was in support to 11th Battalion Royal Sussex Regiment on the 3rd September when the 11th succeeded in entering the enemy’s front line trenches in front of Hamel and from then were in rotation in the front line trenches in the Beaumont-Hamel sector. Private Tite was a member of the Lewis gun team and on the 9th October 1916 he asked the Private in charge of the team for permission to leave the trench. An officer refused his request but did show Private Tite a safe place to stay during a trench mortar demonstration. Shortly thereafter he had disappeared, returning later and was put on periscope duty whilst the officer and the Private in charge went to look for another position for the gun. Private Tite then left the trench again and asked a Sergeant for permission to stay out, this was refused but Private Tite would not return and was arrested and later charged. On the 16th October the Battalion was carrying out work in preparation for the attack on Stuff Trench, digging communication trenches and forming dumps. The Battalion moved up on the 20th October for the attack on the 21st October. Stuff Trench was captured but the Battalion had something of a struggle in bombing forward beyond the original objective in gaining 50 yards of German trench, whilst the other battalions in the Brigade attacking achieved their objectives without much trouble. Still the captured positions were held by the Brigade until the battalions were relieved. Private Tite had not been present however. The Court Martial was at Aveluy on the 2nd November 1916 and in mid November the 39th Division left for the Ypres Salient Private Tite being shot at Poperinghe on the 25th November 1916. The Battalion (2nd Football) had been raised in London in the Summer of 1915 and went to France as part of 123rd Brigade 41st Division in May 1916. Initiation into trench warfare took place in the Le Touquet area. The Battalion arrived on the Somme sector in early September 1916 and by the 9th September 1916 was in Fricourt Camp, camp south of Fricourt village, evacuated by the Germans on the 2nd July 1916. On the 10th the 123rd Brigade began the relief of troops holding the line in front (north) of Delville Wood, the Battalion relieving the 1/10th The King’s (Liverpool Regiment)(Liverpool Scottish). At this period the line was being pushed forward towards Flers by means of sapping, so as to provide suitable positions from which on the 15th September, the assault was to be made. The enemy’s shell fire was heavy, and on the 11th , the Battalion lost 2 Other ranks killed and 15 wounded. On the 12th, two companies went back to Montauban, casualties for the day 8 Other ranks killed 22 wounded and 2 missing. All companies were back in Montauban later and on the 14th September the Battalion moved forward at night to take up assembly positions: the attacking Brigades were the 122nd and the 124th both being at the northern edge of Delville Wood, the 123rd Brigade being in reserve behind. The Battalion were in their assembly trenches by 0100 on the 15th September and the attack began at 0620 led by tanks which had started from positions north of Longueval village. At 1000 the Battalion was sent forward to the left of the Flers road, having to take shelter on several occasions from the German barrage then falling heavily and then at midday further forward until the afternoon, with Flers actually being in British hands but the position north and north-east of the village was still obscure. The Battalion was then formed up to attack. Their objective was a strong point north of Flers Wood known as the Hog’s Head just to the North-East of the village itself. As the Battalion reached the north-east corner of the village itself some 250 survivors of the units of 124th Brigade who had taken part in the attack were met streaming back from the front line. These men were rallied and the Hog’s Head was occupied and held until 1930 when the Battalion was ordered to retire to a line east of Flers village. In that position the Battalion hung on all night exposed to heavy enfilade shell fire until 1800 on the 16th September when they were ordered back until on the 17th September was moved further back until on the 18th all units of the 123rd Brigade went back to Becordel Camp in reserve until the 27th September. The Battalion’s losses were 4 officers killed or dying of wounds, 8 wounded, 22 Other Ranks killed and 129 wounded with 52 missing. The Battalion was in support or reserve at the beginning of the Battle of Le Transloy Ridges on the 1st October when 3 patrols were sent out but no sooner had they started out than the enemy placed a heavy barrage on the front line and although a group managed to dig themselves in some 200 yards from the German line the patrols were withdrawn with losses of 18 other ranks killed, 29 wounded and 11 missing.. The Battalion was involved on the 7th October 1916 when it was again in reserve in Mametz Wood and then moving forward East of Delville Wood leaving the Somme battlefield area on the 9th October the whole Division moving to the Ypres Salient on the 17th October 1916. 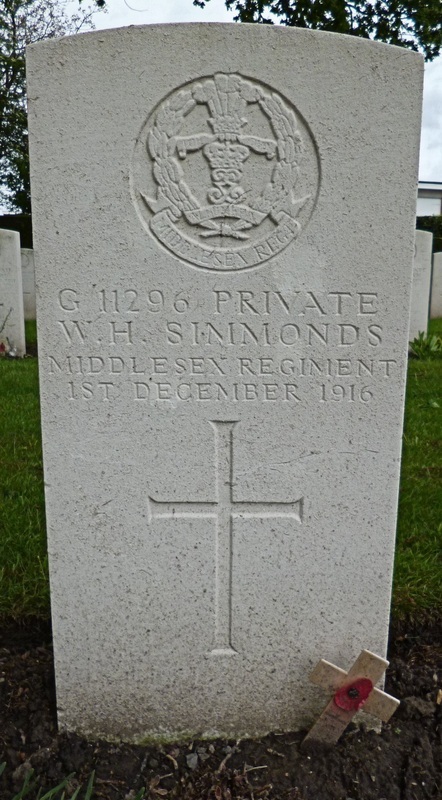 At some time in this period Private Simmonds deserted his comrades; the Court Martial was on the 19th November 1916 and he was shot at Poperinghe on the 1sr December 1916 aged 23 years. 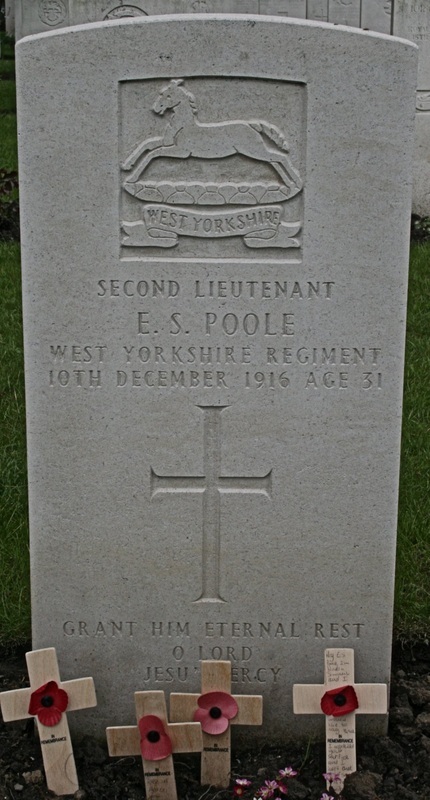 The Battalion was formed at York on the 10th September 1914 and Eric Poole was an early Kitchener volunteer joining the Honourable Artillery Company in October 1914 whilst awaiting an application for a permanent commission but in May 1915 he was given a temporary commission in the 14th (Reserve) Battalion supplying reinforcements to the Western Front. In May 1916 he was posted to the 11th Battalion serving in France, the Battalion itself having landed in France on the 26th August 1915 as part of 69th Brigade, 23rd Division. The Battalion arrived in the Somme sector at the end of June 1916 arriving at Coisy north of Amiens and moving into the line south-east of La Boiselle on the 3rd July 1916, attached to the 34th Division. On the 4th July the Battalion attacked Horseshoe Trench but had to withdraw following counter-attacks; attack and counter attack continued on the 5th with the enemy being cleared from the trench by 1900 when the Battalion was relieved. Following a period away from the front, on the 10th July the Battalion was again in the front lines at Scots Redoubt a strong-point to the east of the village of La Boisselle taken by the 15th Royal Scots on the 2nd July 1916. At 1630 on the 10th July the Battalion attacked Bailiff Wood, the wood and trenches to the north being cleared and held against strong counter-attacks. Later the Battalion advanced further to the north-west corner of Contalmaison before being ordered back on the 11th July to Becourt Wood. During this tour the explosion of a German shell threw up a piece of earth which knocked Lieutenant Poole unconscious. Following examination he was admitted to 38th Casualty Clearing Station at Heilly and on the 8th July sent to No 20 General Hospital at the Base and then transferred to the Canadian Convalescent Home at Dieppe where the Doctor commanding felt he was unfit for service at the front but this decision was overturned by a Medical Board at the Infantry Base Depot at Etaples. On the 13th August 1916 the Battalion was moved north to the Ypres sector returning to the Somme in mid-September 1916 when Lieutenant Poole rejoined his Battalion. On the 4th October the Battalion was ordered forward to the reserve line in La Sars sector and to the front line on the 5th October. On the 7th October the 23rd Division captured the German held village of Le Sars. In so far as 69th Brigade is concerned, 9th Green Howards moved into the south-west of the village linking with the 13th Durham Light Infantry (68th Brigade) at 1430 and eventually the village was cleared. The 11th West Yorkshire attacked Flers Support but were initially unsuccessful until 10th Duke of Wellington’s were sent up in support. That night the Division held both Flers Trench and Flers Support but the Battalion’s losses were 8 officers and 217 other ranks. Just before the Battalion went forward to the front line on the 5th October Lieutenant Poole saw the Medical Officer of a neighbouring battalion and after obtaining tablets for rheumatism he disappeared for two days being found on the morning of the 7th October near Henencourt 3 miles West of Albert. The Brigade Commander sent a note to the Divisional Commander that Poole should be sent home rather than court-martialled. The Division in the meantime had on the 12th October gone north to the Ypres Salient and the Court Martial was held on the 24th November 1916 at Poperinghe and following confirmation of the sentence 2nd Lieutenant Poole was shot at 0730 on the 10th December 1916 aged 31 years. Private Grampton was a Reservist who had been re-called in 1914 and was sent to the 6th Battalion the Yorkshire Regiment which was formed on the 25th August 1914. The Battalion was in the 32nd Brigade part of 11th Division which on the 3rd July 1915 left Liverpool for Gallipoli. The 6th Battalion served on Gallipoli until December 1915 and then as part of 11th Division landed at Marseilles on the 1st July 1916. 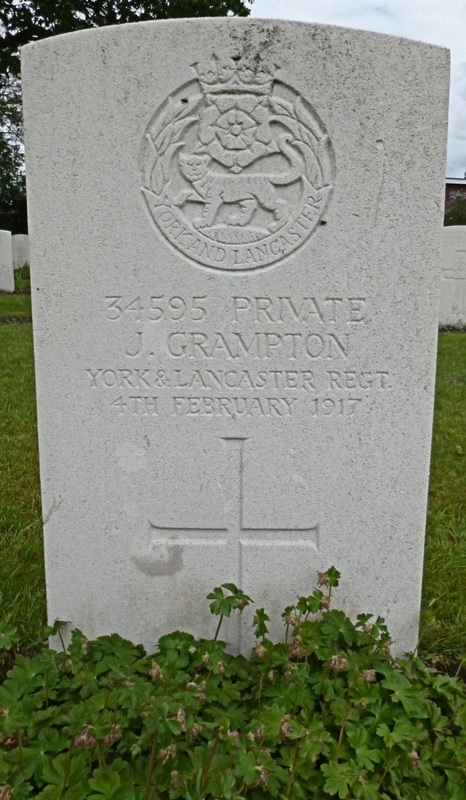 Shortly thereafter Private Grampton was transferred to the 9th Battalion York and Lancaster Regiment. That Battalion was in 70th Brigade 23rd Division and was in the front line at Contalmaison on the 27th July 1916. On the 11th August 1916 the Battalion left the Somme sector for the Armentieres sector when on the 16th August having been ordered to work in the front line trenches with a party from the Royal Engineers Private Grampton made off. On the 12th September the Battalion was sent back to the Somme sector remaining there until the 17th October 1916 when it was sent North to the Ypres sector. At some time in November 1916 Private Grampton was arrested in Armentieres. He was sent back to his unit and following the Court Martial on the 23rd January 1917 was shot at Poperinghe on the 4th February 1917 aged 42 years. The Battalion was formed on the 14th May 1915 and as part of 122nd Brigade 41st Division landed in France on the 2nd May 1916. The 122nd Brigade in the Spring and early Summer, prior to their involvement in the Battle for Messines Ridge which began on the 7th June 1917, were in the St Eloi sector at the Northern end of Messines Ridge. For an offence of desertion Private Fryer had been before a Court Martial and had been sentenced to a term of 2 years imprisonment suspended. 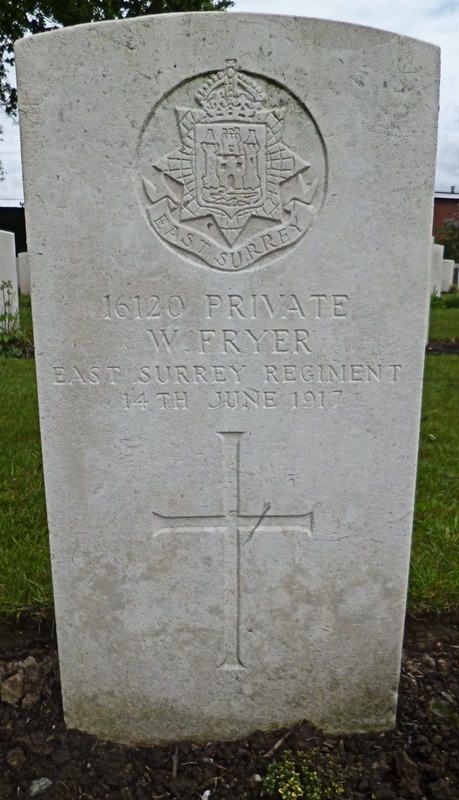 He deserted again almost certainly from the St Eloi sector and following arrest the Court Martial was seemingly on the 10th June 1917 and following confirmation Private Fryer was shot at Poperinghe on the 14th June 1917 aged 23 years. The Battalion was formed at Hamilton in September 1914 and landed in France on the 10th July 1915 as part of 46th Brigade, 15th Division. The Division was in the Salient before the Third Battle Ypres and Private Michael left his comrades in the trenches being arrested and before a Court Martial on the 1st June 1917 On the 31st July 1917 the Third Battle of Ypres began and behind a tremendous barrage the attack began. The 15th Division attacked at 0350 the 46th Brigade using the 7/8th King’s Own Scottish Borderer's and the 10/11th Highland Light Infantry in front with the 10th Scottish Rifles in support. The KOSB met strong resistance from a redoubt in Frezenburg village, until two tanks came forward to aid the attackers. At 0500 the advance continued but it was held up by the Frezenburg Redoubt astride the Ypres-Zonnebeke road until a party of the KOSB eventually outflanked and captured it. The HLI came under fire from Square Farm and Hill 35 and enfilade fire from Frost House. Moving on the HLI took Low Farm but were checked by fire from Pommern Castle and Hill 35 and it was not until 1000 before they reached their objective that day, the Black Line. 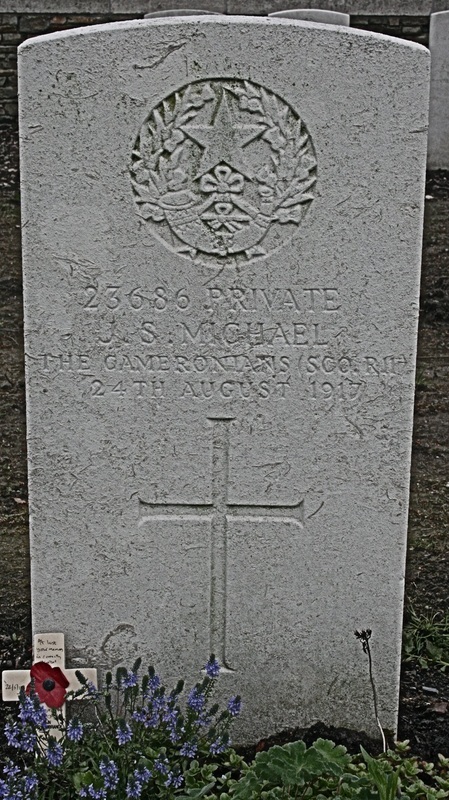 The next occasion that the Battalion was engaged was on the 25th August when the Battalion attempted unsuccessfully to take Iberian Farm North East of Frezenburg on the Frezenburg Ridge but sentence of death having been confirmed, on the previous day the 24th August Private Michael had been shot at Poperinghe. He had been born at Barony, Glasgow. 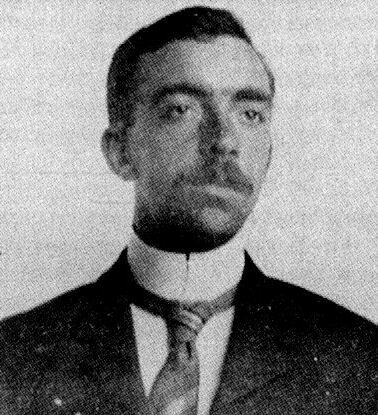 John Wall had enlisted in 1912 and landed at Rouen with his Battalion on the 16th August 1914. The Battalion participated in the BEF Retreat and the subsequent advance to the River Aisne, the fighting in the Neuve Eglise sector and then Messines in 1914, in 1915 remained in the St. Eloi sector and involved in the trench fighting there, before moving North and the attack on Bellerwaerde in June and then in the Autumn attacks on the German positions at Bellerwaerde, Hooge and Sanctuary Wood, in early 1916 the Battalion moved south and was involved in Crater fighting on the Vimy Ridge before going south to the Somme sector being involved in the battles from the 4th July until October before moving back to the Ypres Salient on the 29th October holding the line in the sector North of the River Lys. By February 1917 the Battalion had moved North being in trenches north-east of Ploegsteert Wood and then participating in June in the attack and capture of Messines Ridge moving North to take over trenches at Hooge. The 3rd Battle of Ypres began on the 31st July 1917 with the Battalion in Reserve until moving forward to take over trenches North of Stirling Castle – Inverness Copse – Chateau Wood on Bellerwaerde Ridge. “The Battalion was now to experience a trial equal to almost any other in its career. From the evening of August 1st to that of August 5th the Battalion remained in position. During that time heavy rain fell continuously and the enemy’s shell fire as equally continuous. At night the front of the ridge was plastered with gas-shells of a new type which caused many casualties. The removal of the wounded was most difficult through the deep slime into which the sodden clay was fast being converted. “D” Company on the flank facing the Menin Road lost half its strength through the heavy shelling. “ Having participated in the fighting since arrival in 1914 as a Lance-Corporal, uncharacteristically Sergeant Wall stayed with two Privates in a concrete dugout rather than joining his colleagues in the actual front line some 700 yards further forward, claiming that the area between the dug-out and the trench was fully exposed to German artillery shelling; CSM Davies agreed but claimed crossing the ground was still possible and as a result Sergeant Wall was found guilty of desertion at the Court Martial on the 30th August 1917 the sentence being confirmed, he was shot on the 6th September 1917 aged 22 years. The Battalion landed at St. Nazaire on the 12th September 1914 but Private Everill did not go to France until May 1915. In March 1916 he was before a Court Martial charge with using insubordinate language to a superior officer being sentenced to 12 months’ imprisonment with hard labour (suspended): within weeks he was before a Court again for wilful defiance, a 10 year penal servitude sentence being reduced to two years, he probably serving 9 months in prison. On the 8th March 1917 he was sentenced to 12 months’ imprisonment for being absent, this being commuted to 90 days’ field punishment No 1. Some 3 months later he was convicted of using threatening language to a superior officer, the sentence of 3 years penal servitude being commuted to another 90 days field punishment. On the 29th July 1917 he was sentenced to another 90 days field punishment for an offence of wilful disobedience and was in the guard tent at Dickebusch (3 miles South West of Ypres) where the Battalion was in Divisional support when it was warned on the 24th August to be ready to move up to the front line. The guard and the prisoners, including Private Everill, were likewise warned and fell in behind “A” Company: however when “A” Company moved off, Private Everill had disappeared leaving behind his rifle and equipment he not being found until 1230 am on the 25th August in Reninghelst (3 miles South East of Poperinghe when he managed to get out of the guard-room and was finally arrested and detained on the Reninghelst – Abele Road. 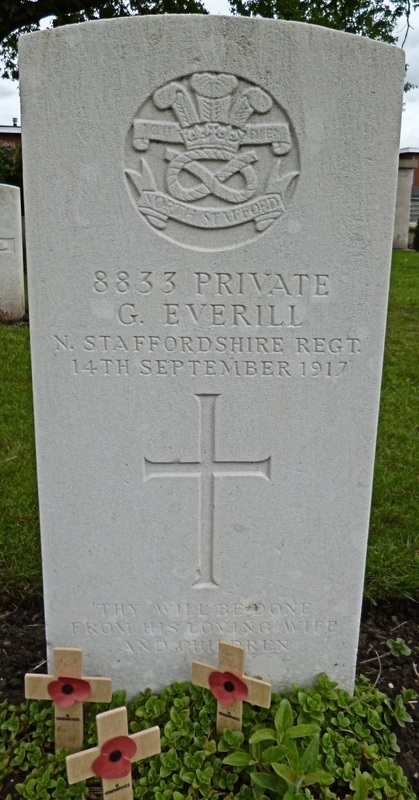 The final Court Martial was on the 3rd September 1917 and following confirmation Private Everill was shot on the 14th September 1917 aged 30 years. 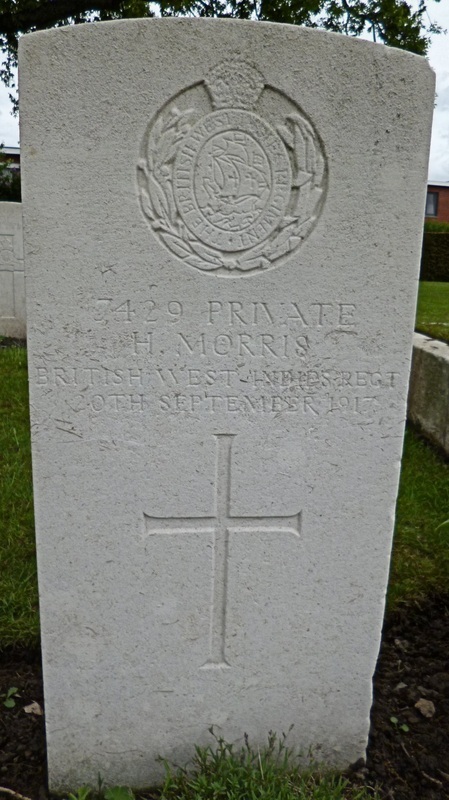 Private Morris lived in Jamaica and had joined the Regiment following a recruitment drive between November 1916 and March 1917. His No 6 Battalion landed at Brest in France on the 17th April having already lost men through disease being buried at sea. By the end of May his unit with two other units from the Regiment were in the Ypres Salient. They were not front line troops but were working mainly for the artillery carrying shells to the heavy howitzers. An observer noted “the ammunition was stacked in small piles like little heaps of manure spread out across the fields …….the blacks are extremely frightened of the big guns. They look afraid and bewildered when they hear a shell coming and if it falls anywhere close they scatter like men possessed.” The 17 years old Private told the Authorities “I am troubled with my head. I cannot stand the sound of the guns. I reported to the doctor but he gave me no medicine or anything.” And so he ran off with fatal consequences. The Court Martial was on the 7th September and following confirmation the young black Private was shot on the 20th September 1917. The Battalion landed at Boulogne in July 1915 and, as Private Gore had enlisted in December 1914, he probably landed in France then. As part of the 18th Division the Battalion was in the Carnoy and Fricourt sector on the Somme for instruction and participating from the 1st July when the Battalion was in Brigade support in the Battle of the Somme being in action up to the 18th November 1916. The Battalion was then rested in the Abbeville area until January 1917 when they moved forward to the Somme sector to find that the Germans had retreated to the Hindenburg Line. By March the Battalion had moved north to the Bethune sector until a move to the Arras sector to take part in the Battle of the Scarpe in particular the attack on the German held village of Cherisy. The Battalion moved to the Ypres sector on the 3rd July 1917 and was based in the Dickebusch area being in the front line trenches by the 7th July and subjected to gas-shelling by the Germans. 61 men were wounded in 17 days at this time. On the 10th August the Battalion was to go up in reserve to Railway Dugouts some 2 miles south east of Ypres. The unit was at Dickebusch Huts when at 1800 the men were warned to parade at 2000 to go up to the front line. 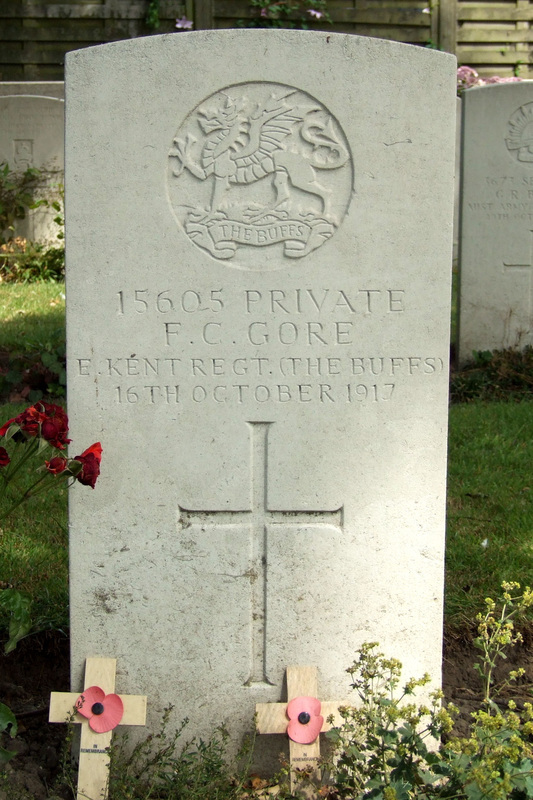 Shortly after Private Gore went missing not being seen until 1000 on the 19th August 1917 in Boulogne when he presented himself to Private Tonks who was on Police duty. He told the Policeman that he was a deserter, he was still in uniform, and gave his name and regiment. At his Court Martial on the 8th September 1917 he said he had deserted his battalion because he could not stand the strain of the shell fire due to his nerves, had been to the Medical Officer who had said he could do nothing for him. He had been convicted in March 1916 for insubordination, whilst in the UK, January 1917 attempting to remove government property, April 1917 absence (for which he lost his lance-corporal’s stripe), he was then in hospital in May 1917 being dealt with in June for the April offence and then in July he was charged with leaving his company without permission being found on the steps of a dugout in another trench. 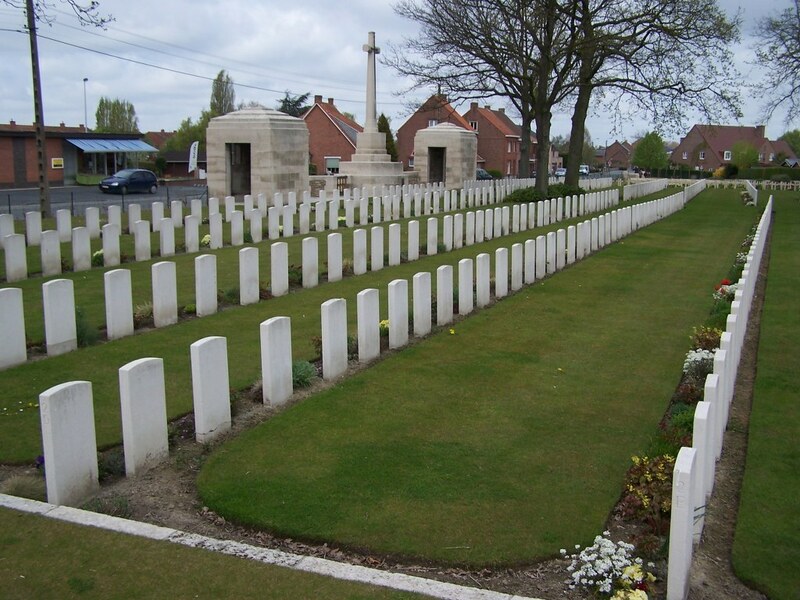 Following confirmation Private Gore was shot on the 16th October 1917 aged 19 years, the last soldier to be executed and buried in this Cemetery.